(a) Temporarily tighten the front disc brake bleeder plug. Fully tighten the front disc brake bleeder plug after bleeding any air left in the system. (b) Install the front disc brake bleeder plug cap. 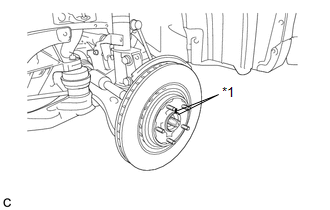 (a) Align the matchmarks of the disc and axle hub, and install the disc. When installing a new disc, select the installation position where the front disc has minimal runout. 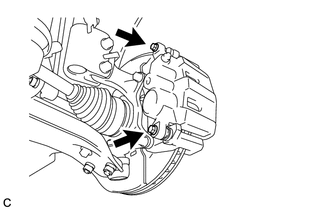 (a) Install the front disc brake cylinder mounting to the steering knuckle with the 2 bolts. 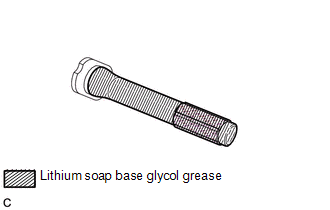 (a) Apply a light layer of lithium soap base glycol grease to the entire circumference of 2 new front disc brake bushing dust boots as shown in the illustration. Apply at least 0.3 g (0.01 oz.) of lithium soap base glycol grease to each front disc brake bushing dust boot. 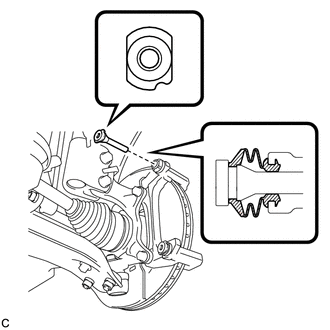 (b) Install the 2 front disc brake bushing dust boots to the front disc brake cylinder mounting as shown in the illustration. 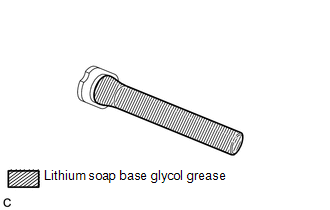 (a) Apply a light layer of lithium soap base glycol grease to the contact surface of a new front disc brake cylinder slide bushing and the No. 2 front disc brake cylinder slide pin. (b) Install the front disc brake cylinder slide bushing to the No. 2 front disc brake cylinder slide pin. 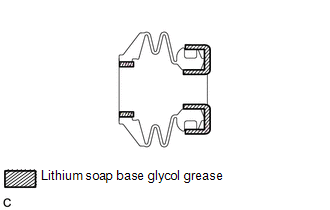 (a) Apply a light layer of lithium soap base glycol grease to the sliding part and the sealing surface of the No. 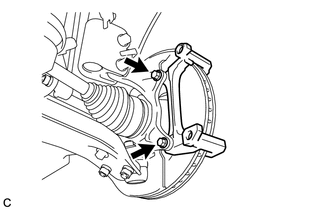 2 front disc brake cylinder slide pin as shown in the illustration. (b) Install the No. 2 front disc brake cylinder slide pin to the front disc brake cylinder mounting. (c) Push the No. 2 front disc brake cylinder slide pin into the front disc brake bushing dust boot to align them. 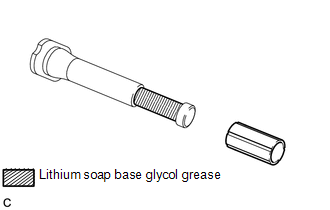 (a) Apply a light layer of lithium soap base glycol grease to the sliding part and the sealing surface of the front disc brake cylinder slide pin as shown in the illustration. (b) Install the front disc brake cylinder slide pin to the front disc brake cylinder mounting. (c) Push the front disc brake cylinder slide pin into the front disc brake bushing dust boot to align them. (a) Install 2 new front disc brake pad support plates to the front disc brake cylinder mounting. Be sure to install the plate in the correct position and direction. 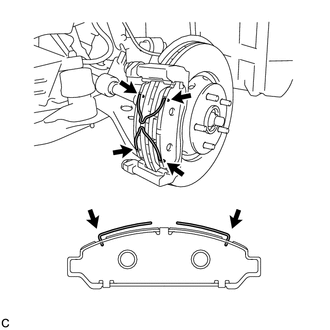 (a) Apply disc brake grease between the front anti-squeal shim and front disc brake pad as shown in the illustration. Apply 1.0 g (0.03 oz.) of disc brake grease to each pad. (b) Install the 2 front anti-squeal shims to the front disc brake pads. When replacing worn pads, the front anti-squeal shims must be replaced together with the pads. Install the front anti-shims in the correct position and direction. Apply disc brake grease to the area that contacts the front anti-squeal shims. Disc brake grease can seep out slightly from the area where the front anti-squeal shim is installed. Make sure that disc brake grease is not applied onto the lining surface. 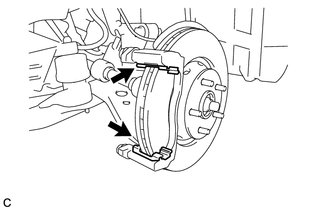 (a) Install the 2 front disc brake pads to the front disc brake cylinder mounting as shown in the illustration. There should be no oil or grease on the friction surfaces of the front disc brake pads or the front disc. 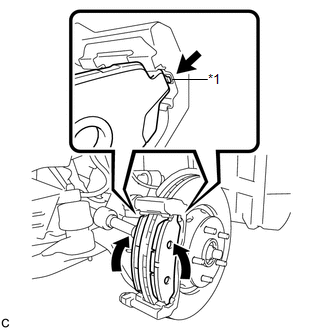 Make sure to install the front disc brake pad with pad wear indicator to the inner side of the vehicle. 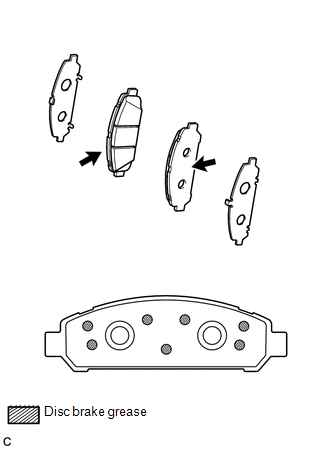 Be sure to engage the protrusion of the pad support plate to the front disc brake pad. (b) Install the 2 anti-squeal springs to the front disc brake pads. When replacing the front brake pads with new ones, make sure to replace the anti-squeal springs at the same time. Be sure to install the anti-squeal springs into the front disc brake pad installation holes as far as they will go. 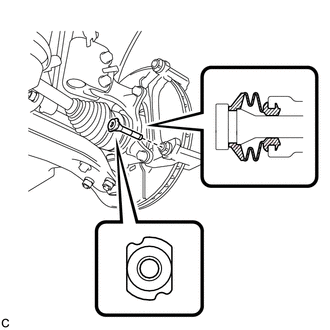 (a) Install the front disc brake cylinder assembly to the front disc brake cylinder mounting with the 2 bolts. Be sure that the anti-squeal springs are installed to the front disc brake pads. 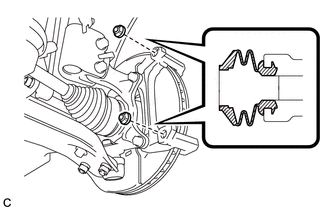 (a) Connect the front flexible hose to the front disc brake cylinder assembly with a new union bolt and a new gasket. 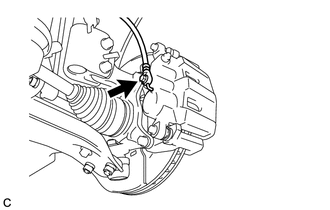 Install the front flexible hose lock securely into the lock hole in the front disc brake cylinder assembly.